The identiFINDER™ from ICx Technologies is the world's leading spectrometer, dose rate meter and nuclide finder for portable radiation detection and identification applications. 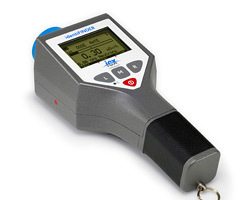 The handheld identiFINDER allows the user to locate a radioactive or nuclear source and, once found, identify the isotope(s) in an easy to use, four key system with performance that meets or exceeds ANSI N42.34 for radiation detection. ICx Technologies was acquired by FLIR Systems, who have introduced a new model, the FLIR identiFINDER 2. Learn more about our Maintenance Management for Griffin 450 GC/MS and all of your analytical instruments. KD Analytical Maintenance Management is a suite of services that can save you money and time while helping to guarantee the readiness of your ICx identiFINDER and all of your analytical instruments. ReadiTrak web-based asset readiness manager tracks instrument status, preventative maintenance, repair history, and maintenance costs of your identiFINDER instruments and virtually any other gear your count on to do your job. One-call, 24x7x365 reachback support for identiFINDER and all of your instruments, regardless of manufacturer. Our analytical instrument experts help you complete most maintenance over the phone, saving you money. Expert repair for your identiFINDER provided by our support center. And, we manage OEM/warranty repairs when needed, eliminating headaches and reducing downtime for your team.